Has your cat been "going" outside of the box as of late? When a cat stops using the litter box, there's always a reason. Your first impulse may be to shout at the cat, but that will just frighten and confuse him. Cats are not vengeful, and he is not going outside his box to get back at you for pushing him off the sofa. Instead, look at what may have triggered this change, which you yourself may have inadvertently caused. Because cats are habitually clean, Frisky may be upset by a litter box that isn't changed often enough to suit him, even if you think every other day is OK. Would you use a bathroom with an unflushed toilet? Changes in household routine may also be cause to forgo the box. 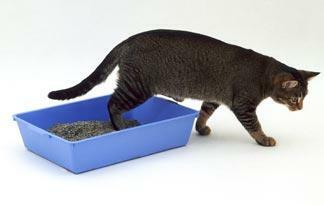 If you've added a new cat, the resident feline may dislike using the same litter box as the newcomer. He may also not appreciate that you've replaced his regular litter with a new-fangled one. Cats are keenly aware of the scent and feel of their litter, so if you've changed brands or types to take advantage of a sale, your cat may not approve of the savings the way you do. A move to a new home or a student back from college for the summer can also upset him. Using the carpet rather than the box may also be a sign of disease. Cats suffering from urinary tract infections may associate painful attempts at urination with the litter box, and avoid it. A cat who's thirstier due to kidney, liver or thyroid conditions needs to urinate more frequently, and may not get to his box on time. Similarly, feline diarrhea or constipation may find him desperate to go without caring where. Observe the cat and notice if he is straining to go and/or crying out. He may claw out a space in a potted plant, choosing clean dirt over a soiled litter box. Or he may squat on your carpet or floor because he associates the sensation of digging in litter with uncomfortable elimination. If you confine him to a closed room with a clean litter box and he ignores it, he may have no control over his actions. This signals that illness, not behavior, is the culprit. The cat is in pain, and your vet needs to determine why. A thorough checkup will reveal whether Kitty has a urinary tract infection, inflammatory bowel disease, diabetes, arthritis, kidney, liver or thyroid malfunction or other illnesses that may affect his litter box habits. If illness, minor or serious, is the cause, medication or treatment should relieve his pain and distress. Whatever has pushed your cat out of the box, getting him back on track will take patience. If anxiety created the problem, set up a quiet retreat for the cat to do his business in a room or area with minimal household traffic. Provide a large-enough litter box -- or two -- with the kind of litter your cat prefers, and change it frequently, even several times a day if necessary. You may decide to confine him for a few days to establish a new, calmer routine. Inflammatory bowel disease, constipation, diarrhea or urinary tract infections will abate with medication or treatment, so if one of these caused your cat's problem, he should return to using his litter box as his discomfort eases. Longer-term conditions, such as arthritis or kidney problems, may mean making adjustments: Be sure the cat's box is low enough for him to get into comfortably, and offer more than one box to accommodate more frequent usage. Always keep the litter boxes clean by washing and disinfecting them weekly and quickly removing soiled litter.